Strathcona Park turns 100, and becomes even more accessible thanks to new Wilderness Centre. Hope Lewis, ed Sarah Gunter, Emily Vossler and a half dozen other kids are leaning over the rails of a corral fence. They watch intently as Hope’s father, John Lewis, demonstrates how to properly lead and ‘square up’ a 1,000-pound Hereford cow for a showmanship competition. “You need to hold its head up, like this,” says Lewis as he pulls on the lead rope and raises the animal’s head, which is the size of a giant watermelon. For the life of me, I simply cannot image little Sarah, age 11, handling such a large animal in a show ring. I am, however, quickly assured that there are always plenty of adults in the ring alongside the pint-sized handlers, ready and able to leap into action and assist should any of the animals get out of control. Lewis stops walking the cow, then taps one of its hooves with a pole. Obediently, the cow moves her leg back until suitably ‘square’ and then stands patiently for inspection. Learning to show beef and dairy cattle is serious business for these young people, all of whom are members of the Comox Valley 4-H Calf Club. The two demonstration heifers, Daisy and Clover, and a steer named Frank, are just three of the 4-H Calf Club’s ‘projects’ that have been entered into various exhibitions this August, including the Pacific National Exhibition (PNE) in Vancouver and the Comox Valley Fall Fair. “4-H is a lot of fun,” says Hope Lewis, centre, with cousins Jenna Van Velzen (left) and Rhyan Lewis. 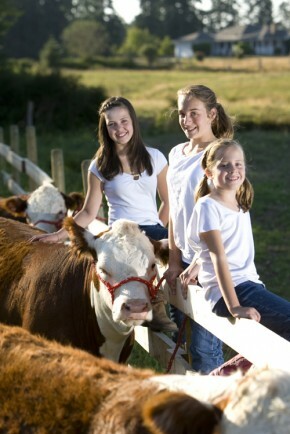 The girls are part of the local 4-H Calf Club, and will be showing their project animals at the PNE in August. This will be 11-year-old Hope Lewis’ second time at the PNE—she will be showing both a steer and a heifer at the event. She will be joined by her cousins Jenna Van Velzen, 14, with her steer, Frederickton, and Rhyan Lewis, 10, and her heifer, Clover. Because Hope and Rhyan have chosen heifers (young females), rather than steers (young castrated males), as their project animals, they will be able to bring Daisy and Clover home to the family farm when the four-day event is over. Next year, Hope plans to enter both Daisy and her calf in the competition. For Hope’s steer, Pez, and 12-year-old Blair Schmelz’s steer, Frank, as well as two others who are making the journey from the Island to the PNE, however, this will be their final destination. At 18 months of age and weighing in at around 1,200 pounds, the Hereford steers are ready to be sold for meat. That said, Schmelz turns away and becomes focused once again on what Lewis is teaching. One gets the feeling that what might appear to some to be ‘aloofness’ is more a coping mechanism, and young Schmelz has mixed emotions with respect to selling Frank. On the topic of raising and selling livestock, Comox Valley District 4-H Leader Elizabeth Legault says she had lost track of how many times she has stood at the PNE with a young person crying on her shoulder. Unfortunately, the average urbanite usually only sees the end result of the 4-H association—by watching kids and their hogs, sheep, goats, cattle or other types of animals at regional fairs. It is important to understand that this is only a small part of 4-H program. Kids sign up for various 4-H programs in January and don’t even start raising their project animals until spring. Meanwhile, there are monthly meetings where they learn about animal husbandry and farm safety. They do a little fund raising and take field trips. In January, each 4-H member chooses a topic, researches it, and then creates a three-sided education board to be worked on at home. The range of topics covered is vast and could include everything from farm safety, first aid, technology, or something as simple as how to build a birdhouse. The education boards are entered into various district, regional and provincial competitions where they are judged according to age-appropriate criteria. For some people, this would be even more daunting that trying to wrangle that 1,000-pound steer. The 4-H kids, however, have fun creating and showing off these important projects. Trina Gunter, adult leader for the 4-H Calf Club, has spent many years involved with the program. It is her job to oversee the business aspects of its operation and she does this with a firm hand and a gentle heart. It is obvious the kids adore her. Her role is vast, covering everything from ensuring that proper meeting protocol is followed, that the Treasurer’s Report is accurate, that entry forms for the fairs are submitted and so much more. Gunter sticks with it, she says, not because she has six children that need to be kept busy, but because it is a great way to teach young people responsibility and valuable social skills. The 4-H clubs also work with community groups, such as Toastmasters, to help club members develop excellent communication and presentation skills. This helps them with the education board competitions and when showing their animals at various exhibitions, where they answer questions from the general public with confidence, poise and professionalism. In the spring, the children work with their parents and leaders to choose a lamb, piglet, calf, or other type of animal. They are expected to spend about an hour a day looking after their livestock and must keep record books to log the animals’ progress and the cost of feed. Activity and commitment increases in July, when the animals have to be groomed and trained for upcoming shows. The 4-H Comox Valley Calf Club, from left: leader Trina Gunter, club president Emily Vossler, Blair Schmelz, club vice-president Megan Gunter, Noah Gunter, Jenna Van Velzen, Hope Lewis, Rhyan Lewis and Sarah Gunter. All of the skills the 4-H kids acquire and the experiences they have meeting new people, public speaking, traveling, making new friends and generally becoming well-rounded citizens will serve them well later in life, as they become young adults and go away to school or get their first jobs. The skills offered by 4-H are not new—in fact, the club is more than a century old. Programs to enlighten youth about new farming practices and technology date back to about 1890. Even then, the lure of the big cities was considered to be a threat to the future of the family farm. Creation of the 4-H program, as we know it today, has been credited to an Ohio man named A.B. Graham. His program was established in 1902. The now familiar 4-H symbol—a distinctive cloverleaf emblem emblazoned with four letter H’s that represent head, heart, hands and health—was developed a few years later. As times changed, so did the 4-H curriculum, but the core of the program today is still a commitment to provide youth with an opportunity to learn how to become productive, self-assured adults who can make their community and country a good place in which to live. The philosophy of 4-H, as explained in their motto, is as relevant today as it was when written many decades ago: Learn to do by doing. The 4-H movement started in British Columbia in 1914, when more than 200 young people were involved in a potato-growing project sponsored by the Department of Agriculture. (It was initially called the Boys and Girls Clubs and was re-named ‘4-H’ in 1952, in order to represent the head, hands, heart and health motto.) Over the past 96 years, 4-H has grown and now has more than 2,350 youth and hundreds of leaders province-wide. The BC 4-H program has four age categories: Cloverbuds is for kids ages six-to-eight, Junior for those ages nine-to-12, and Senior for 13-to-19-year olds. Young adults, ages 20-to-21, can become 4-H Ambassadors and travel to various clubs in other regions to share their knowledge and expertise with others. While the kids are responsible for managing their individual projects and running their respective clubs, adult volunteer leaders oversee all activities. 4-H Clubs on Vancouver Island are divided into several Regional Districts—South Malahat, Cowichan, Cedar, Parksville-Qualicum, Powell River, Port Alberni and the Comox Valley. The Comox Valley 4-H Club currently has about 75 members and 15 leaders active in five divisions: a Calf Club, which includes both beef and dairy cattle; the Tsolum 4-H Sheep Club, Comox Valley 4-H Swine Club, Comox Valley 4-H Horse Tails and the Gumbooters. Gumbooters is the branch of the District 4-H Club that includes ‘odd stock’—the animals and activities that don’t fit into any of other the other divisions. This currently includes poultry and other fowl, rabbits, cavies (Guinea pigs), goats, donkeys and dogs, as well as food and crafts. The list of animals and activities changes each year, as long as enough adults step forward to assist. In previous years, for example, chinchillas, sugar gliders, sewing and small engines have also been included in the mix. Other current community sponsors include Lloydshaven Farms, who supply the dairy cows for the Calf Club, as well as the Comox Valley Exhibition Association, Dodge City Video, Black Creek Farm and Feed, the Comox Valley Farmers Institute, Comox Valley Dodge, Co-op, Casawood Farms and several other individuals and families. Fundraising is a part of the 4-H program and the Gumbooters kids, for example, raise money to support their activities by setting up petting farms at various local events. With a menagerie of chickens, goats, rabbits and other small animals, the petting farm helps the 4-H kids raise cash. It also provides them with an opportunity to practice those all-important public speaking skills while sharing their knowledge of animal husbandry and handling. “The great thing about Gumbooters 4-H Club is that it enables kids who do not live on farms or have a farming background to participate in 4-H,” says Gumbooters leader, Janet Martyn. The cost for kids to join 4-H is $60 per year and financial assistance is available to families with several children or those who may not be able to afford the full dues. But the number of kids that can be enrolled each year really depends on the commitment of adults in the community to come forward as volunteer leaders—more are always needed! Prospective new leaders can be a young or old, new to agriculture or experienced. After an initial interview and a police check, prospective leaders must participate in the provincial 4-H training programs, which cover the gamut from learning the 4-H Code of Ethics, to new developments in agriculture, recognizing signs of child abuse, how to deliver the program, and more. Emily Vossler, age 15, has been in 4-H for six years and, like her fellow members, has many fond memories of going to the PNE and other fairs, attending 4-H camps and getting involved with the community. For more about 4-H check out www.bc4h.bc.ca or call Elizabeth Legault at 250.338.1479. 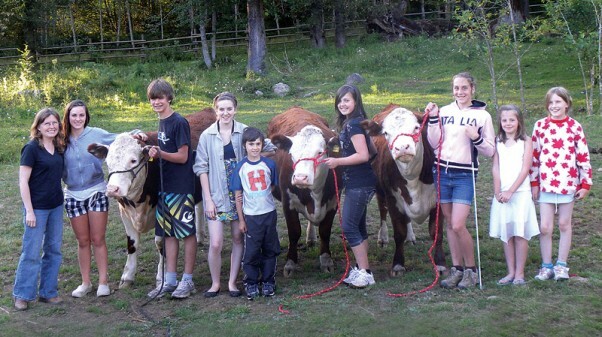 See the local 4-H kids in action at the Comox Valley Exhibition Fall Fair, August 27-29 at the Courtenay Fairgrounds. Hope Lewis, Sarah Gunter, Emily Vossler and a half dozen other kids are leaning over the rails of a corral fence. They watch intently as Hope’s father, John Lewis, demonstrates how to properly lead and ‘square up’ a 1,000-pound Hereford cow for a showmanship competition. begins commemorating its 100th year this summer. Strathcona Park has a special significance as BC’s first Provincial Park, and the largest on Vancouver Island. Celebrations for BC Parks’ 100th anniversary in 2011 began this past July, with a Centennial Expedition retracing the footsteps of the original Discovery Expedition through the mountains that became Strathcona Park. Much of the wilderness of the park is most easily reached from the communities of Campbell River and Gold River, but the Forbidden Plateau and Paradise Meadows areas are in our own backyard. Just in time for the centennial, the Strathcona Wilderness Centre up at Paradise Meadows has finally been completed, and is staffed on summer weekends until mid-September. 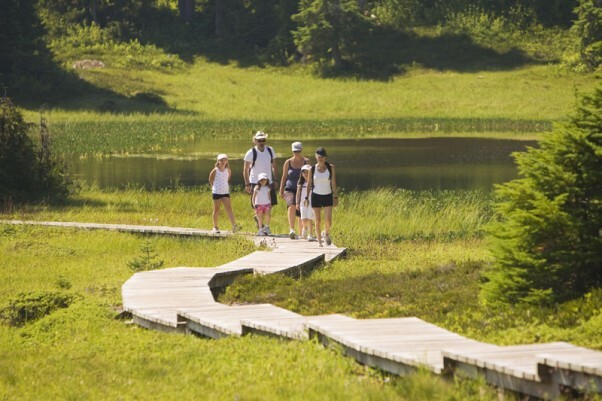 The Centre, adjacent to Mount Washington Alpine Resort’s Raven Lodge, is operated by the Strathcona Wilderness Institute, and is the starting point for nature and art walks with guest experts, and guided hikes for all levels. The Strathcona Wilderness Institute (SWI) was founded in the mid-1990s to promote sensitive and enjoyable use of Strathcona Provincial Park. The Wilderness Centre building, as a focal point for SWI’s programs at Paradise Meadows, was several years in the making. “When Mount Washington’s Raven Lodge was built, the resort and BC Parks had talks and decided to move the Paradise Meadows trailhead closer to the Lodge,” recalls SWI founding member Steve Smith. Then in 2007 the Resort gave .06 hectares of land for the new park entrance and trailhead into the Meadows. SWI set out to fund-raise for an information centre, and when Mount Washington offered a 16’x20’ building that was built for the ski area by the students of Highland School, the structure was incorporated into a building designed by Rob Wood. “This was the catalyst that really began to make things happen,” says Smith. Throughout the coming year, BC will celebrate the 100th anniversary of the birth of its world-renowned parks system. The ascent of Crown Mountain near Campbell River on July 29, 1910, by the Strathcona Discovery Expedition led by Price Ellison, BC Minister of Land, is considered to be the starting point that inspired the creation of BC’s Provincial Parks system. To celebrate the anniversary, a re-enactment of the original 1910 expedition began July 22, 2010 from Campbell River and is planned to arrive in Port Alberni on August 7. “Ellison, his 20-year-old daughter Myra and an assortment of timber cruisers, naturalists, packers and canoe men from the Cowichan First Nation were dispatched by the Premier Sir Richard McBride to explore the Strathcona Reserve and assess its suitability for a park. Over five weeks they paddled and poled tons of supplies up the turbulent Campbell River, assailed the steep forested slopes and craggy summit of Crown Mountain and arrived triumphant in Port Alberni on August 11, 1910,” notes Philip Stone, expedition organizer and local mountaineer. The past 100 years of Strathcona Park history have been well chronicled in Beyond Nootka, written by current SWI director Lindsay Elms. Born in Australia, Elms acquired mountaineering skills in New Zealand and then all around the world. He worked as a Mountaineering Instructor for the Canadian Outdoor Leadership Training (COLT) program at Strathcona Park Lodge, adjacent to Strathcona Park on Buttle Lake, while continuing climbing. Elms has climbed more than 200 of Vancouver Island’s peaks, and maintains his fitness through running, completing numerous marathons and endurance races. Beyond Nootka, available at the Wilderness Centre, tells the tales of many of the people involved with Strathcona Park as well as the stories behind the names of many of the features. The Park itself was named in 1911 for Donald Alexander Smith, First Baron Strathcona and Mount Royal. Smith was a Scottish-born Canadian fur trader, financier, railroad baron and politician whose 75-year tenure with the Hudson’s Bay Company included governing for 20-plus years until his death in 1914. Smith is also known as the man who drove ‘the last spike’ into the CPR railway connecting the Atlantic to the Pacific. Gwyn Sproule points out a dogwood flower to a group at the Strathcona Wilderness Centre, which offers guided hikes of the park. Mount Albert Edward, prominently visible from the Wilderness Centre up at Paradise Meadows, was named for Albert Edward, Prince of Wales, later King Edward VII. Other features visible from the Wilderness Centre were named for more local notables—Mount Elma was named for the wife of Theed Pearse, mayor of Courtenay from 1928-29. Pearse was an avid naturalist, and in 1968 at the age of 96, self-published Birds of the Early Explorers in the Northern Pacific. Another well-known naturalist’s name was given to an adjacent peak—Mount Allan Brooks. First named in 1939 for Major Allan Cyril Brooks, renowned ornithologist and artist who spent part of every year at his home in Comox, this dedication was extended in 2004 to include his son, Allan Cecil Brooks, biologist, teacher, and naturalist, who moved to the Comox area in the early 1980s. 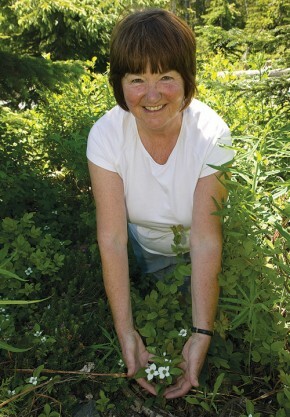 The Strathcona Park connections don’t stop there—Betty Brooks, daughter-in-law of Major Brooks, is an expert naturalist in her own right and was the first female interpreter for BC Parks. Continuing to be active with Strathcona Park as a director with the Strathcona Wilderness Institute, Brooks is also caretaker of the Strathcona Park Important Bird Area, designated a Nationally Significant IBA. The park is home to the core of the Vancouver Island White-tailed Ptarmigan population, a subspecies occurring only in the central montane portions of Vancouver Island. Many directors of the Strathcona Wilderness Institute have their own personal connections to the park. Long-time director Gerry Roberts has operated the Information Hut at Buttle Lake for more than 10 years on behalf of SWI. Over the years he has seen visitors “from as far away as the Canary Islands, Korea, Israel, Kuwait and Nepal. “The Buttle Hut is more than just an information centre,” says Roberts, who has been asked to provide automotive fluids, band-aids and pain relievers to hikers and park visitors. Evan Loveless, who is also involved with the Wilderness Tourism Association as executive director, hikes frequently in the park with his family. John Waters has climbed many peaks in the Park and is active in rock-climbing—along with his twin brother, he recorded all the climbs at Comox Lake in a recently published guide book available at the Wilderness Centre. SWI founding member Steve Smith was originally active with the Friends of Strathcona Park, formed in the mid-1980s. Like many elders, the Park is an excellent teacher. The setting is a magnificent classroom, whether for natural history subjects such as flowers, birds, insects, trees, and geology, or human endeavors such as art, photography, hiking and mountaineering. Local naturalists including Betty Brooks and Gwyn Sproule recently guided nature walks on Spring Flora & Fauna and Ethnobotany in the meadows, attended by Valley residents and visitors from as far as Switzerland. Botanist Fred Constabel will guide an outing looking for mid-summer flowers on Sunday, August 8. Forester Harold Macy will explore the working of an individual tree and the collective energy of the forest on Sunday, August 22. Members of the Comox Valley Naturalists Society and the Comox District Mountaineering Club have volunteered to guide a number of day hikes into the meadows and Plateau area. SWI has also partnered with Island Alpine Guides to offer multi-day expeditions for those who want to upgrade their mountaineering skills with an expert guide. On the ‘Castlecrag Circuit’ from September 4-6, participants can take in three summits on a spectacular circumnavigation. “From a base camp at Circlet Lake we do a day long circle walk carrying only light day packs,” says Jan Neuspiel, guide with Island Alpine and lead forecaster for the Vancouver Island Avalanche Centre. “We reach the summits of Mount Albert Edward, Mount Frink and Castle Crag, then return to base camp and walk out on our third day. Participants need only to be reasonably fit to carry an overnight pack to and from the base camp, with the peak day being done with a light day pack.” There is a fee for this excursion—interested participants are asked to register directly with Island Alpine Guides by August 14. As a landscape painter, Powsey is greatly inspired by Strathcona Park. “I recognize all the content of beautiful and terrifying nineteenth century landscape paintings in the park’s geography,” he says. “Plunging chasms, falls, glaciers with crevasses and icefalls, landslides and avalanches, thick vapors and precipitation, rock faced valleys and rugged peaks—there is enough topography in the park to spend a full and rewarding lifetime of exploration, hiking and climbing, or painting. “It’s amazing how the Park has survived, despite damage, for a hundred years,” Powsey adds. “I hope the next 100 years will see it become more, not less pristine, with areas of damage and road intrusion eliminated and naturalized. As well, I think it would be valuable to expand the park and its alpine and high elevation forests up and down the central core of the Island to preserve other watersheds and create wildlife corridors. Keeping and expanding the central alpine core of Vancouver Island within the park in a pristine state will be of great value to future Island residents for recreation, as a natural wildlife reservoir and also for water quality and conservation. Looking for interesting photographic subjects and compositions, nature photographer Chris Carter will be guiding Great Photo-Ops in Paradise Meadows’ on Sunday September 12. Participants do not need a camera—Carter will hand out mat-board framing guides for participants to use, to identify possible shots. Carter decided to find out more and joined the Comox District Mountaineering Club (CDMC). “My youngest son was still at home and became a willing hiking companion on many Club hikes as I experienced more of the park,” he says. “The next milestone on my Strathcona experience was the government’s attempts to convert swaths of the park into recreational areas—a thinly veiled description of opening the park to miners and logging. He will show prints of what he has done in the area prior to his photography walk on September 12. The lower floor of the Wilderness Centre building is ideal for such presentations, as well as workshops or talks for community organizations and school groups, containing a screen for presentations and seating for 30 people. The lower floor is also available for day rentals during the summer season.